Environmental tax reform (ETR) is an important and integral part of a sustainable development strategy. ETR is an effective way of integrating economic, social and environmental costs into the price of goods and services while creating incentives for sustainable practices. In recent years, some developing countries in the Asia-Pacific region have introduced schemes to phase out fuel subsidies and are moving towards further reforms to modernize their fiscal governance and tax practices and make greater use of ETR as a primary component of national development strategies. Indeed, several countries in the region are forerunners for ETR outside OECD countries, including India, Indonesia, Thailand, Viet Nam and China. This paper examines the rationale for the implementation of ETR in Asia-Pacific and its possible role in the achievement of the Sustainable Development Goals (SDGs). It offers policymakers practical guidance on how governments can reform tax systems and use fiscal policy to drive the transition to a low-carbon, climate-resilient economy while taking into account the specific challenges of developing countries in the region. The paper is divided in two parts. Part I provides background information on ETR and looks at experiences in OECD countries. 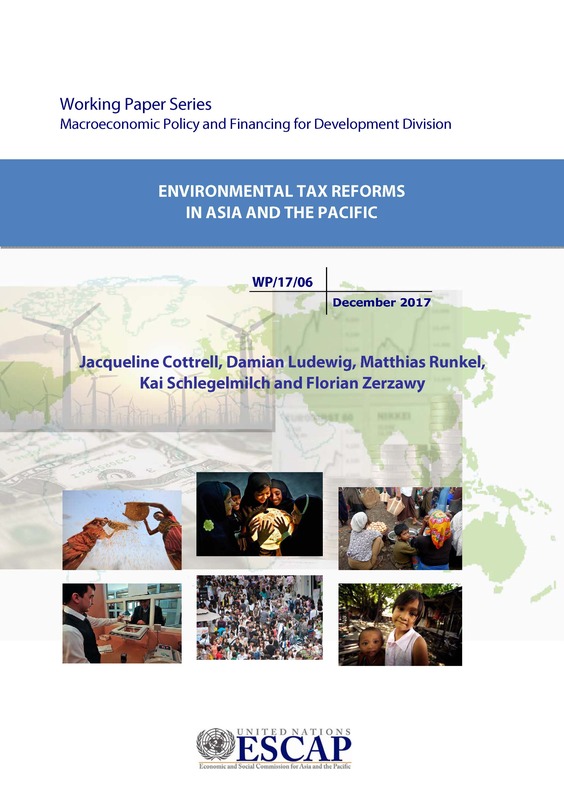 Part II focuses on ETR in the Asia-Pacific region and makes a series of recommendations for policymakers, examining strategic and political economy considerations typically encountered by policymakers during the process of implementing environmental taxes, as well as practical issues relating to tax design, policy planning and implementation. Finally, the paper looks at international and regional policy processes upon which policymakers in Asia-Pacific can draw on for support and consultation while implementing ETR measures.